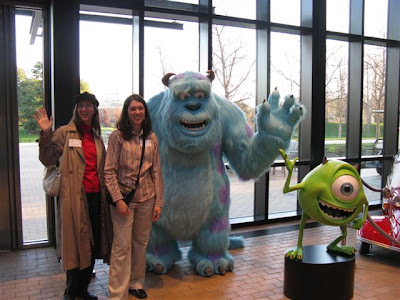 Here are some pictures from my recent tour of Pixar Animation Studios! First here I am posing by the front doors with my sister Rachel, Sully, and Mike. Next we have my whole family standing by the front gate after the tour, plus a pedestrian who happened by at the time and told us we needed some more color in the picture. You can probably guess which one she is. 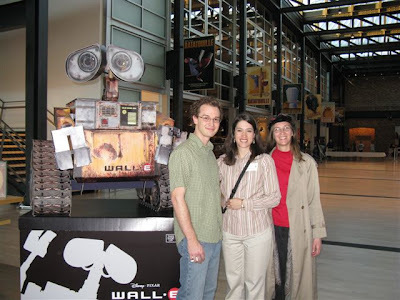 Last, in my favorite shot, we have Wall-E, my brother Jon the rendering intern who got us in for the tour, my sister Rachel, and myself. My favorite part of the tour was the Render Farm, a room full of more computing power than you can shake a surge protector at. All those blinking lights and humming processors! It was cool! 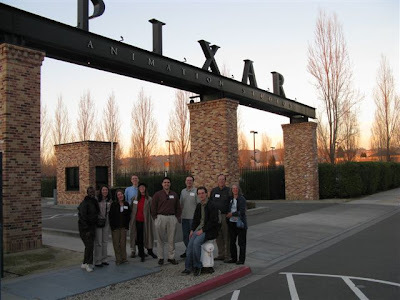 I'd like to assure the folks at Pixar that my brother Jon told us NOTHING about their upcoming project, the one he is working on, except that he was working on it and that he could tell us NOTHING about it. Except that he thinks it is going to be the best thing Pixar has ever done. All because of you, Jon, right? Who Says Children Have More Imagination? A common myth purveyed by the entertainment industry in this country is that children have more imagination than adults. How many times have you seen the imaginative child scolded by an un-imaginative parent who is annoyed by the child’s flights of fancy? This is a lie. I happen to be an adult, and I live with five children. At our house, the kids are always trying to rein me in. This morning when it was time to pick up my five year old from Kindergarten I told my two year old that it was time to get in the stroller and go get his brother. Why bother with the stroller? thought my two year old, so while I put on my coat he opened the front door and charged down the sidewalk. I cut a rakish figure chasing after him with my trench coat and scarf flying and an empty stroller bouncing along the sidewalk behind me. Both of us were laughing by the time I caught up to him and hooked my fingers in the hood of his jacket to make the catch. Then I buckled him in the stroller and we walked very sedately the rest of the way to the school. As I stood in the school yard and waited I realized that I had lost the belt of my trench coat. I figured it must have fallen off while I was running. When my five year old came out of his classroom I told him we were going on a hunt. We were going to look for my belt as we walked home. “Mom, I think you left your belt at home,” he told me when we were half way down the street. He hadn’t seen it yet and I guess he thought that meant it wasn’t out here. Sure enough, as we came around the corner, my belt lay stretched along the sidewalk, just a few yards from where I had stopped running. “Your belt was all the way back here!” my five year old was surprised. Later that afternoon as I put folded laundry away in the drawers I discovered where all the stuffed animals hiding in a big pile in the corner of the boys’ room. “It’s a den of wild animals!” I exclaimed. “Where?” My five-year-old came in from playing out in the hall. Last Saturday my family convened in California for my grandmother's funeral. After the services we were all going over to my dad's cousin's place to see their new winery. As five of us climbed into my brother Jon's car, my brother Jason asked for an address so that he could plug it into his GPS. Angie, my sister-in-law, gave him the address. She had been very careful to get it from my mother during the funeral luncheon. “I have to put in the city. Is it in Lodi?” Jason asked. Yes, we had all been to cousin Tom's place many times. We would go there every summer to play in the river that wound through his grape orchards, to pick blackberries and elderberries for pies, and to visit with the folks in the old farmhouse that great-great grandpa Jack built. But none of us had ever driven there. Especially not from the chapel in Galt. “It’s in Acampo,” Jon said. “Wouldn’t it be easier to ask for directions?” I suggested. As we drove we talked and enjoyed ourselves, often talking so loud that Jon missed the GPS saying “Turn right in 300 feet” or “Make a left turn.” Jason had to keep telling him to turn around and get on the right course. We reminisced about summer visits to the ranch; all the peaches you could eat fresh off the tree, the walnuts, the river, the blackberries. “Okay, who can do the best sheep impression?” Jon challenged us. Jim, Jason, and Jon all burst out in amazingly accurate renditions of sheep vocalization. We were all laughing. It sounded just like sleeping out in the camper trailer at the ranch with the sheep singing to you all night long, an experience we had all shared many times. At first the landscape all looked familiar. Country roads, farm houses, grapes and fields and the occasional dairy farm. But then, after a while I noticed that we were driving in country I had never before seen. The land was flat and swampy. We drove past a flock of birders with their spotting scope, standing by the side of the road looking at waterfowl. “It says we’re here,” Jason told us as we drove by the gate of the bird sanctuary. I didn’t even know there was a bird sanctuary near the ranch. “This doesn’t look like it,” Jim said. “Doesn’t look like it at all.” I agreed. “What did you put in for the town?” Angie asked. "Did you put in Acampo?" “I put in Lodi,” Jason said. “It came up as a valid address, so I figured I’d got it right,” He poked at his GPS for a few moments. “How far?” we all insisted. We all laughed and moaned and called dad to let him know we weren’t dead and that we were on our way. It would have been easier to ask for directions. This past week I have very much enjoyed remembering President Gordon B. Hinkley, President of the Church of Jesus Christ of Latter-Day Saints, who passed away a week and a day ago. I thought I would share my favorite memories with you today. Many years ago when Russel and I were attending BYU we went to October General Conference. It was an unusually hot sunny day for early fall in Utah, and the Tabernacle was stuffy and uncomfortable. When President Hinkley came to the podium to announce the next speaker he said, "We are sorry that it is so warm." Then he paused, and said in that dear, straightforward but droll voice of his, "You will all be a lot warmer if you don't repent." Two years later as I sat listening to the general women's meeting, only days before delivering my first child, I listened in awe as President Hinkley read the Proclamation on the Family. It so clearly laid out for me what I was to do and teach my children to do as I embarked on this new venture of motherhood! I liked it so much I cut it out of the newspaper the next day and glued it into my journal. There has been a copy of it on my wall for as long as I have had children in my home. There were a few years in the middle of Hinkley's presidency when he would announce a big surprise nearly every time he stepped up to the pulpit. He announced the restructuring of the quorums of the seventies to allow the church to grow to whatever size it would, he announced the building of small temples, he announced the Conference Center, he announced the Perpetual Education Fund, he announced the rebuilding of the Nauvoo temple. Going to General Conference was exciting simply because we wondered what vast sweeping changes President Hinkley would announce next! As a personal tribute to President Hinkley, I have decided to try and follow his example of optimism and encouragement. He would always make me feel as if I was doing a great job, but somehow at the same time he made me want to do better! I'm going to make it my personal goal to learn how to do that for my husband and children. I decided this after the garbage truck drove away without our garbage this morning. As I heard it go roaring down the street I yelled, "Garbage! GARBAGE!" in a very disappointed and angry voice. "I'm getting my shoes on!" my husband snapped back. In exasperation I flopped back in my chair and rolled my eyes at the ceiling. How could we have missed the garbage AGAIN? We had plenty of time to take it out this morning! Why didn't we remember? "Too late!" my husband yelled as he came back in the house. Then I thought of what President Hinkley would say. He would say, "Think of all the trouble you saved the garbage man, and I'm sure you'll remember to take it out it on Thursday." If I had said that, then no one would be mad! And the garbage would go out on Thursday, and everything would work out fine. Thank you, President Hinkley! I will always remember.